News of a sequel of a movie that you love can feel a little bittersweet: On one hand you get to revisit a fictional world that you love. On the other, there's a not insignificant chance that visit will be unpleasant and awkward. Even worse, though, can be news of a prequel. After reading about the kinds of movies we'd be happy to never see again, a discussion began about what made prequels, in particular, so likely to be left unloved. For some commenters, the problem boiled down to one issue in particular: Spoilers. Has there ever been a good prequel? I struggle to think of even one. They basically come with the ending pre-spoiled for you, since you know who definitely lives and what will be like afterwards. The lameness of the prequel is something I should point out to the 'its the journey, not the ending' people that are always trying to tell me its okay to get spoiled, and a bad ending can't ruin a good first 3/4ths. The Godfather Part II was mostly a prequel. That's all I've got (for now). I wonder if Godfather Part II works so well because it's simultaneously prequel and sequel. I like to refer to it as The Rise and Fall of the Corleone Empire. In the past, Vito avenges his father and builds a criminal empire, and maintains the love of his family. In the present, Michael has (in a sense) avenged his father and build a bigger criminal empire, but in the process his family falls apart. It's fodder for so many lines of contrast, comparison, and analysis. I'm not so much a fan of the Godfather Saga cut, where the scenes from all three films are edited together in chronological sequence because I feel the impact of Part II is lost when Vito's rise isn't contrasted with Michael's fall. EDIT: The TL/DR is, I suppose, that most prequels seem to be made to answer questions we didn't actually need answers for (even if we thought we wanted them). Godfather II uses the prequel to bring up new questions: e.g., why did Michael fail where his father succeeded? 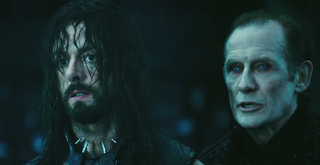 I enjoyed Underworld: Rise of the Lycans but I'm not sure I can call it good. So does news of an upcoming prequel send you along with cheer, dread, or some curious mixture of the two in your heart? Tell us why (along with some examples of which prequels did or didn't work) in the comments.